Christmas Pudding Cookies are chocolate sugar cookies decorated to look like a traditional Christmas pudding which is a date pudding popular in the UK and my favorite holiday dessert growing up. 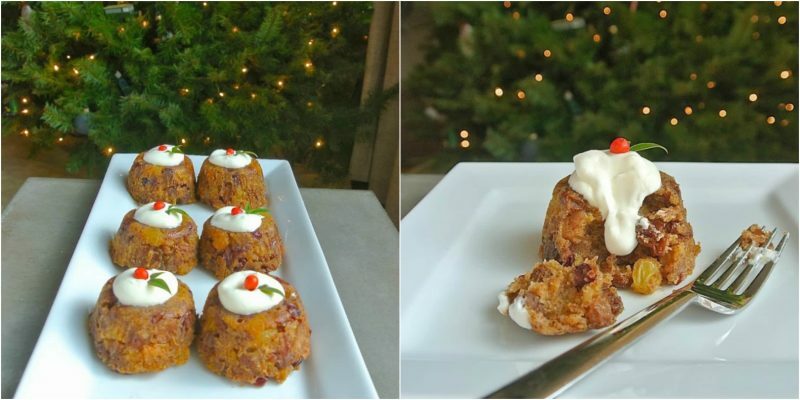 Last Christmas season I made individual Christmas puddings. If you’re not familiar with Christmas pudding, it is a date pudding that is traditionally served in the UK at Christmas for dessert, topped with brandy cream and garnished with holly. I noticed that not only do I have a distinct lack of cookies on this blog, but I am desperate need of Christmas cookies, so I just changed that. Chocolate lovers will love how chocolatey these cookies are and they’re not too sweet. These cookies make great gifts for teachers or just to thank your local delivery man or a holiday party hostess gift. I’m also posting a white chocolate, pistachio and cranberry fudge later this week, which also makes a festive gift. The cookies are chocolate sugar cookies that I adapted from my friend Allie from Baking a Moment recipe. Allie is a very talented baker and she has great tips to get perfectly smooth cookies that don’t spread which is perfect for these cookies to get a perfectly round look. Thanks Allie! To reproduce the look of the cream that is drizzled over the pudding, I took a little help from Wilton.com and used their pre-packaged icing. The icing is easy to use and spreads beautifully and hardens quickly into a smooth frosting. The holly is made from fondant dyed green, also bought from Wilton and to cut the leaves I used this holly leaf plunger and the berries are red frosting. If you do choose to give these as gifts, you could nestle in a wooden box, like cute one I found. Or, place them in cellophane gift bags that are used for party favors that can be found in so many stores and secure them with pretty holiday ribbon. Fun gift and personalized giving. To a mixing bowl with hand blender or stand mixer add the butter, sugar, oil and vanilla. Cream until the sugar is dissolved and smooth then add the egg and mix in well. Don't over mix. Use a spatula to fold in the salt, cocoa powder, flour and corn starch. Mix until there is no flour visible. Lay out a large piece of plastic wrap and turn out the dough into the center. Cut the dough in half and wrap half in plastic wrap and refrigerate. With the other 1/2 of the dough add to a sheet of parchment paper and put another sheet of parchment on top. (rolling in parchment stops the rolling pin from sticking to the dough). Use a rolling pin to roll out the dough to 1/4 inch thick. Using a 2 inch cookie cutter, cut out rounds and put them onto a parchment covered baking sheet, 1/2 inch apart. Remove the other half of the cookie dough from the fridge and repeat, rolling it out and cutting the cookies. Place them all on a parchment lined baking sheet and bake for 10-12 minutes. Remove and allow to cool completely on a cooling rack. Once cooled, use the white cookie icing to draw the frosting so it looks like it's dripping down the cookie. Roll out the green fondant and cut out the holly. Once the icing is dry, place the holly at the top and in the middle of the icing. Ooo… I’ve never heard of Christmas pudding, but it sounds wonderful! That’s one of the things I love about your blog – I get schooled in classic UK dishes. And your translation into these adorable cookies is just so creative. Beautifully decorated too! These are super cute ! Love that you used fondant to decorate! Pinned to my Christmas cookie collection! These cookies look and sound delicious. I **need** that holly leaf plunger – too cute!